" We were delighted by viewing this site wherein we found a sea of knowledge copiously flowing with works of exegesis and the fundamental references and sources in this primary field of the Islamic Sciences and Heritage." "Your website is every Quranic scholar's dream come true. I came across it by chance and am now in my 2nd hour enjoying the contents thereof!... " Through an enormous scholarly labour, each of the Qur’anic Commentaries (tafsir or tafseer) has been typed in, word by word, individually, and at least triple checked by different teams of scholars—none have been scanned in—in order to make it possible, through the use of the latest technology, to search and cross-reference for single words or groups of words, hadiths, or Qur’anic verses anywhere on website database. The on-going third and final phase of Altafsir.com will see the addition of English translations of a number of classical Qur’anic commentaries (tafsir or tafseer) specially commissioned by the project, by leading international translators. Prior to AlTafsir.com no complete, unabridged quality translation of a Classical Qur’anic Commentary (tafsir or tafseer) into English had ever been published! AlTafsir.com has commissioned the translations of: (Suyuti and Mahalli’s) Tafsir al-Jalalayn; the Tafsir of Ibn ‘Abbas; the Asbab al-Nuzul of Al-Wahidi; the Tafsir of Al-Tustari; the Tafsir of Baydawi, and the Tafsir of Kashani into English; and the translation of Tafsir, Al-Bahr Al-Madid for Ibn ‘Ajiba’, into English and French. It has also commissioned a modern scientific Tafsir of the Qur’an by Professor Usman Bakr of Malaysia. Future plans include the translation into English of Nasafi’s Tafsir and of the great tafsir, Mafatih al-Ghayb, of Fakhr Al-Din Al-Razi. All the translated Qur’anic Commentaries are unabridged, and totally unchanged apart from corrections in spelling or editing mistakes. AlTafsir.com never adjusts or changes original works, even when they do not reflect the opinions and beliefs of the Royal Aal al-Bayt Institute for Islamic Thought. The reader or scholar can make up their own minds. The mission of Altafsir.com is to give them the complete resources to do that, free of charge, 24 hours a day, 365 days a year, anywhere in the world, at the touch of a button. Additional resources include a user-friendly interface for the study and comparison of all the established variant readings (qira’at) and tonal keys (maqams) of Qur’an recitation. For students of tajwid and researchers alike, the differences between the Warsh, Hafs and other modes of recitation are a mouse-click away, in the voices of the Islamic World’s most beloved Qur’an reciters. The audio-video format will aid users in memorizing the Qur’an and also in studying and applying the rulings and variations in recitation styles. 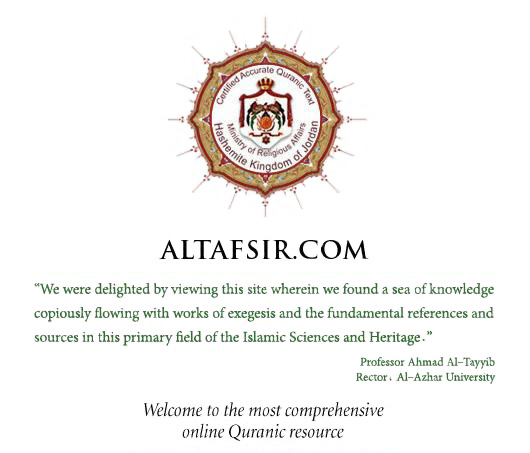 Since 2006 Altafsir.com has also become the most popular and most visited Qur’anic Commentary (tafsir or tafseer) website in the world. It is a unique and invaluable Qur’anic studies resource that facilitates a better understanding and appreciation of the Sacred Text of the Islamic faith—the Holy Qur’an. Al Tafsir.com - Tafseer Holy Quran, Quran Translations, Quran Recitations, Quran Interpretation (Tafseer), and Quran Sciences. Al Tafsir.com - Tafseer Holy Quran, Quran Translations, Quran Recitations, Quran Interpretation (Tafseer), and Quran Sciences.